Note that some actions (e.g. Aggregate) transform data in table, and some (e.g. Run Program) don't because they perform an external operation such as export to a file, or starting an external application. 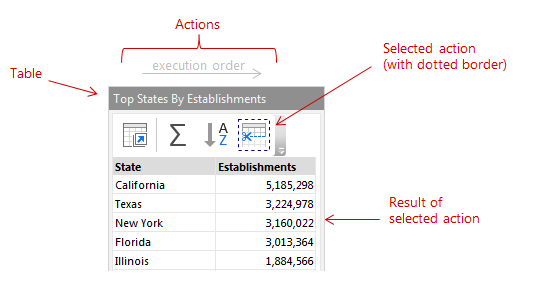 Actions that transform table data or perform an external operation are shown in tables as pictograms. In EasyMorph you don't have to connect transformations with arrows. It is implicitly assumed that if one action is followed by another then the output of the former becomes the input of the latter. Hint: Drag actions to re-order them or move from one table to another. When an action is selected (clicked) its result is shown in the data grid, and its properties are shown in the sidebar. 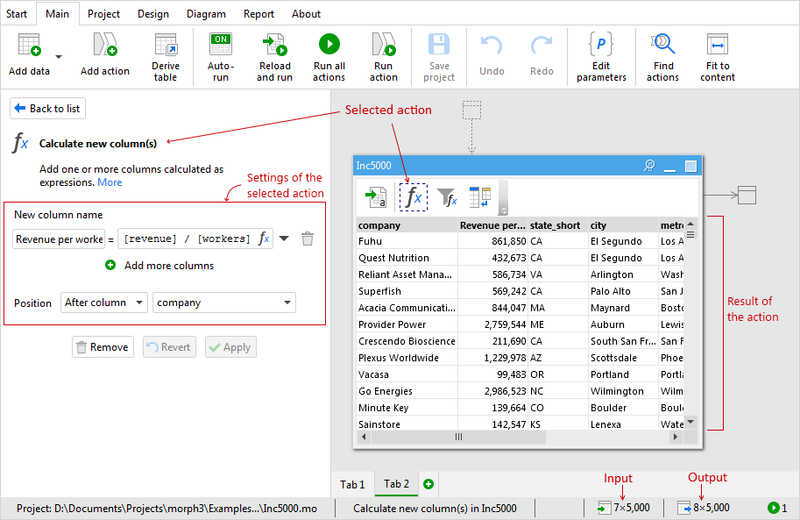 You can click consequent actions in a table one after another and see how the table data changes step by step. It's like a "time machine", in a way. The result of the last action in a table is the table's final state. Some actions (e.g. Merge) require two tables. If such action refers to another table, it refers to the other table's final state, not to a result of particular action. Hint: Double-click the table title bar to switch to the full screen table view. Hint: In the status bar you can see the number of columns and rows in the input and output of selected action. Notice that EasyMorph project can have several tabs, similarly to a spreadsheet. Tables can be moved to different tabs to reduce clutter and group calculations in logical sections. The order of tabs doesn't influence the order in which actions are executed. EasyMorph doesn't store data in project files. Data is loaded and actions are calculated when a project is run. All calculations are performed on the computer that runs the project. No data is sent out to the cloud (unless you explicitly instruct EasyMorph to perform an external action with a cloud system, e.g. transfer a file to Amazon S3 bucket). The video below explains the user interface and basic operations in EasyMorph. Note that the demonstration was recorded for version 3.6 released some time ago, therefore some menus and buttons may look different than in the current version. EasyMorph comes with a few pre-installed examples that you can see on the Start page of the application. Every example comes with a detailed description and explanation. The examples also includes the Inc5000 example shown in the vidio above. Hint: You can find more examples and ask questions about EasyMorph on the EasyMorph Community forum.